OJEE 2017 Counselling- ओडिशा जॉइंट एंट्रेंस एग्जामिनेशन काउंसलिंग: is going to be conducted in the third week of July 2017. The OJEE is an entrance examination known as Odisha Joint entrance examination and is conducted for the admission of the candidates in the various colleges of Odisha state which offers undergraduate engineering courses. 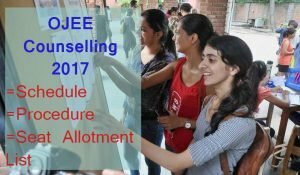 The applicant can appear in the OJEE Counselling Procedure 2017 by clearing JEE Main 2017 with minimum cut off marks. There are some subsequent steps involved in OJEE Engineering Admission such as filling of OJEE 2017 Counselling Form, choice filling, document verification process and some more. At last of the counselling, you will get a confirmed seat in one of the institutions of Odisha state through the conduction of OJEE 2017 Seat Allotment Procedure. OJEE Counselling will be conducted in the last week of July 2017. The OJEE Counselling schedule has not released with the exact date, however, we are giving an idea of the duration in which the counselling can be conducted. When the exact dates of the counselling would be announced on the official website. Till then we are providing you complete details about Odisha JEE Counselling 2017 on the same page. The applicants of OJEE 2017 Counselling necessarily need to fill OJEE Counselling form which will be available on the official website after the announcement of OJEE Result 2017. After the successful submission of OJEE Counselling Registration form they will have to attend choice filling and document verification Process.And at last they will get a seat in one of the institution of Odisha state which offers under graduate engineering course. The OJEE 2017 Registration Form will soon be available on the official website. The applicants will have to enter their personal and academic details in the application form of the counselling. The candidate will later require entering their institutions of choice which are located in Odisha state. Afterwards their choices will be considered as per their rank in JEE Main 2017/ OJEE 2017. Each of the candidate is required carry all of the following documents at the nodal center for the verification of the process. The students should keep in mind that this is the most important process of OJEE Counselling 2017. Each of the candidate should have completed 12th class education from a recognised institution or school. All of the candidates must have qualified OJEE/ JEE Main 2017 entrance examination with minimum cut off marks. The government of Odisha will soon release the OJEE 2017 Seat Allotment Result on the official website in the second week of August 2017. When the authority will release the OJEE Round I,II Merit list, we will also update the same on the same site.